Mother St. Paul gives a wonderful summation of how God prepared His people and our world to receive the Messiah. She ends the reflection with a beautiful prayer. “Ever since God at the time of man’s fall had made His great promise concerning the Woman and her Seed, He that was to come had been to the nations “their desired One,” That promise had been carefully cherished, handed on from father to son till Moses came and recorded it in the book of Genesis ; and though of necessity one nation had to be selected to which the Woman and her Seed were to belong, yet the promise was given to all nations and all claimed their share in it. The chosen nation through whom all the others were to be blessed was Abraham’s. Through him and his seed the great promise was to be fulfilled (Gen. 12:3) The time was hinted at in the patriarch Jacob’s blessing to Judah : “The sceptre shall not be taken away from Judah, nor a ruler from his thigh, till He come that is to be sent and He shall be the expectation of nations” (Gen.49:10). *In this beautiful painting are Jewish prophets and pagan writers all who waited for the Messiah. 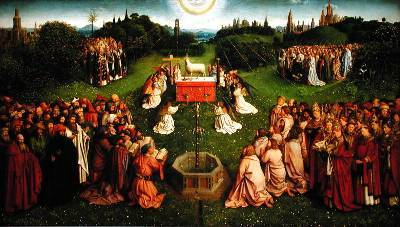 We also see women and men who were martyred for the faith, the Twelve Apostles as well as Popes, and Bishops and Priests – all surrounding the desire of their hearts – the Mystic Lamb, Jesus. JUST 18 MORE PRAYING DAYS ‘TIL CHRIST’S BIRTH!